Posted on October 6, 2015 by Lea S.
Out of all the silent film genres, one of the most popular is probably horror. Even people who don’t watch anything made before 1930…or, well, 1960…or, let’s face it, 1997…don’t mind tuning into Nosferatu or The Phantom of the Opera. 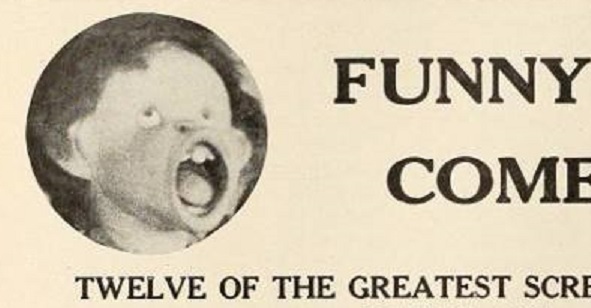 What was freaky then is usually still freaky now, and at any rate it’s always fun to see what used to scare the knickerbockers off our great-grandparents. “Silents That Would’ve Terrified Me as a Child” films aren’t too hard to spot. Keep in mind that outright horror doesn’t quite fit the subgenre–because, come on, that’s too easy. No, most examples of STWTMAACs (dibs on the hashtag) are films that were whimsical and innocent at the time of release but have since aged into…creepiness. Much like every freakin’ ventriloquist act from vaudeville. Actors in animal costumes are usually a tipoff. 1900s papier-mâché masks are a dead giveaway. Let’s just say that if 7-year-old me had gotten even a glimpse of the following films that the nightmares would only have stopped…let’s see…six days ago. Oh, and maybe don’t show the following films to any newbie you’re trying to help fall in love with the silent genre. Some uninitiated souls can find silent movies creepy just by the virtue of being old and at a speed they aren’t used to. The following films…probably won’t help. Honorable Mention: Charley Bowers’s A Sleepless Night (1940). Okay, this is cheating–it’s not even a silent film. 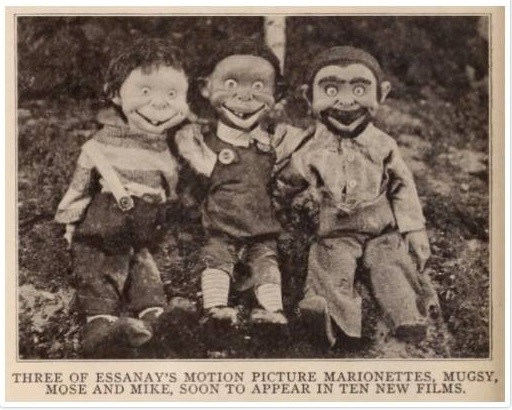 But it is by a filmmaker/animator known for his charming work during the silent era, and it does feature one of the most horrifying stop motion puppets my involuntarily bleeding eyes have ever beheld. In case you’re wondering, that’s supposed to be a dog. A funny dog that’s supposed to cause laughter and mirthful enjoyment, not be a grimacing hellhound made of soggy Kleenex. If there’s any upside to Bowers’s work being lost for so long, it’s that the Child Me was spared from ever seeing this creation. Don’t get me wrong, I love Charley Bowers. His work is amazingly clever and fun to watch. And yes, some of it’s weird. But in this case, I can only assume that the character design was the result of Charley being on some kind of absinthe/chocolate cake/imitation crab meat bender. This piece of a schizophrenic’s darkest hallucinations is attributed to director Segundo de Chomón. It’s a kind of fantasy/comedy film about the exploits of picnickers who find out they have some seriously rotten food, and who return home to suffer nightmares purportedly caused by the rotten food they didn’t even eat. It is, without a doubt, one of the most bizarre silent films I’ve ever seen, and I’m super thankful that Child Me was spared from seeing such an unholy spectacle. I almost made a gif of the bug-infested sausage, but…it’s pretty rough. Let me share the horror with you, so that I am no longer alone. If you ever hear the faint sound of maniacal laughter in your head, it’s probably from this thing. I don’t even know what else to say, only that as long as this film exists it shall remain a threat to the psyches of innocent children everywhere. Too little to be a one-reeler, or even a split-reeler, this one joke film (joke-reeler?) is about a man shaving his face. Before you get up and walk away, let me reiterate: it’s about a man shaving his face who takes a bite of his shaving cream, because why not, and then suffers a series of hallucinations. This is usually what he looks like before coffee. Finally, a moment in one of these films that I can understand. I once saw that particular head described as “Ed Gein wearing the skinned face of Alfred E. Neuman,” which is too perfect a description to ever be topped. “An Edwardian Christmas film? Really?” you say incredulously. I shake my head with a gentle smile. Ah, my friend, how innocent thou art…but not for long. This Russian film was based on a tale by Ukrainian writer Nikolai Gogol, one that decidedly does not involve sugar plums or pop songs about rockin’ around a tree. It was filmed by Ladislas Starevich, an obscure figure today who made a number of unusual and charming stop motion shorts about anthropomorphic insects (they’re great). Do I really need to explain why the 7-year-old me would not have responded well to this? Do I??! It’s an obscure film that I enjoy today for its imagination and beautiful imagery, although at times my enjoyment is tempered by…unease. I’m thankful I saw The Blue Bird as an adult with some knowledge of the silent era under my belt, because dang would my grade-school self have been creeped out by this. Part of the story has to do with the fairy giving Mytyl and Tyltyl a magical hat that allows them to “see” the souls of “Things”–that is, Water, Fire, Milk, Bread, etc. They even see the souls of their pets (which are Things? ), transformed into pasty-faced humanoids who don’t make the kids scream and run away. And they apparently have spasms. These Things would not have filled the Child Me with joy and wonder. And who knows what I would’ve thought of, say, the Soul of Sugar, who looks a little like the Tin Man crossed with an overly-friendly mime. Grandma cheerfully summons something like seven deceased siblings, who file down the staircase and surround the gleeful Mytyl. I know the child mortality rate was higher back in the day, but good heavens. Apologies to the poetic Tourneur, but after seeing this Child Me would have ended up hiding under a blanket as the vague sense of unease took over my stomach and slowly spread to my entire being. So after witnessing all that and after bathing ourselves in holy water, watching a brief film of a stage act featuring a dancer in a big pig costume can’t be that bad, right? After all, it’s a pretty good costume for the time. The act is a definitely weird, and has that slight Island of Dr. Moreau vibe, but it has its own unique charm. I guess. My apologies, I seem to have blacked out for a moment. Anyhoo, these films were all pretty much the worst things you could’ve plunked before my prepubescent eyes. But believe it or not, it could’ve be worse, my friends. Oh yes, it could’ve been so…so…much…worse. If you gaze into their eyes, make sure you’re holding onto a crucifix. Sweet dreams, my friends. Sweet not-at-all-killer-puppet-infested dreams. This entry was posted in Exploring the Silent Era and tagged Ladislas Starevich, Le cochon danseur, Maurice Tourneur, shorts, silent horror by Lea S.. Bookmark the permalink. Oh my gosh, this is freaking HYSTERICAL!!!!! AND totally creepy!!!! Whoah! Those gifts are going to give ME nightmares, and I’m a fully-grown adult!!!! Ah! La Barbe!!! What the….?!!!!!! “The Night Before Christmas”!!! Innocuous enough title! And I thought Beelzebub was terrifying in last night’s “Faust” viewing!!!!!! After “The Bluebird”, Tourneur directed “Poor Little Rich Girl” and there’s some creepy stuff in that one, too, when she’s been drugged so much that she’s having an overdose and having very strange visions, with some very strange creatures, including some who have faces on both sides of their heads…….towards the end. Similar to “Bluebird”. It’s not silent, but the creatures in “March Of The Wooden Soliders” always creeped me out! Not just the bad “boogeymen” wolf-creatures, but some of what was supposed to be the cute and cuddly, friendly characters! Had a really bad day today, but my gosh, this blogpost completely cheered me up! Thanks, Lea! How does the (silent) film hold up to the book?!!!! I haven’t reread the book since, but if any of my memories are correct the film is easier to handle! Haha this list was both terrifying and awesome! I just read the whole thing again and laughed the whole time! Thanks for (re)reading! It was a fun one to write, that’s for sure! Good list, Lea. I feel uncomfortable just from having read it. Two more that will scar the psyche of any child: 1. “Electrocuting an Elephant,” which I first saw between features on a late night horror show. 2. Edwin S Porter’s “The Teddy Bears.” The ending. Bad. The memories of those two films are rushing back now…I hope the elephant didn’t feel anything, but it’s pretty disconcerting to see that smoke coming up. Totally agree about The Teddy Bears…..cruel ending. I would have re-introduced the bears at the ending, taking a bow! I just love your style, Lea!! Not to mention choice of topics. What a terrific piece on the imaginative (and creepy and scary) films that were made so long ago. Much scarier and definitely weirder than anything made today, even with all the effects, bells, and whistles available to filmmakers. Your running commentary on each film you covered was just hilarious. Worthy writing indeed and totally fun to read. Thank you so much! You’re welcome–thought it would be a fun post for Halloween! Some of the imagery in old films seems to have something more in common with nightmares than anything else…real nightmares, that is. Yup, you know what I mean! Ooo, a harp would go with it nicely. I do recommend The Blue Bird, it really is a beautifully made film. It’s an excellent example of the kind of fantasy that was popular in the early 20th century. Still, it’s one of those films that I KNOW would’ve creeped me out as a kid. Judging by the IMDb reviews I’m not alone! I love Starevich’s work, especially “Christmas Eve.” It is a more grown-up story, I suppose, but really, children are too sheltered today. Ivan Mosjoukine gives us a believable, animalistic Devil who clearly appeals to the baser instincts. I dunno, some kids are certainly sheltered somewhat, but there’s some pretty freaky/gory stuff in today’s horror movies and video games. And there’s the “creepypasta” stories abounding on the Internet (that’s where we got Slender Man). It’s just that the kind of costumes they had back in the silent era are a different kind of scariness, more authentically nightmarish. I’m thinking that the demon miiight be kind of a comical character, but it sure hasn’t aged well today. The whole lascivious aspect doesn’t help either! Thanks for the warning! 😉 Yeah, a historian also happily broke the news to me that a few of those shorts survive…made sure to correct that paragraph. I completely lost it at “I EAT SOULS,” oh my GOODNESS. Very informative post! Think I’m going to start tracking some of these down today. Then, without prep ahead of time, I’ll watch one with my husband. Perfect Halloween surprise, lol.